January 19, 2016 by iCepts Technology Group, Inc.
Running a successful business depends on the ability to gain insight into business data and extract and present information in a meaningful way. A company’s employees need to be able to transform data into actionable insight no matter where they are located in the organization. Dynamics NAV gives businesses greater control over their financials and can simplify their supply chain, manufacturing, and operations. Dynamics NAV puts all the information for your organization and users all in one place. No more hunting for data from many different systems so that you can make the best decisions for your company. These below 3 core business intelligence features in Dynamics NAV 2016 highlights how vital information can be found across the enterprise. 1. Reporting. To keep business on track, it’s essential to monitor current activity and compare it to historical performance and plans. The user needs easy access to specific data related to their task or role, the ability to perform repetitive business processes and have formatted grouped data – all as part of the standard application and setup. 2. Charts and KPI’s. Monitoring organization perfor­mance and drilling into more detail when trends are spotted provides more insight into how the business is performing. The user needs access to simple, easily identifiable business drivers to see the organization at a glance. Dynamics NAV allow for viewing the status of the organization at a glance with charts and KPIs. Charts and KPIs (Key Performance Indicators); making it possible for you and your employees to spot trends faster. 3. Ad-hoc Query and Analysis. Robust analysis capabili­ties within an easy and familiar tool like Microsoft Office Excel enable the actionable insight required to change the direction of a negative trend or take advantage of a positive trend. To remain competitive, companies must be able to compare plans to actuals, analyze that information, make the necessary adjust­ments, and then take action to move forward. In this scenario, the user needs to address specific business questions and problems and perform data calculations. Businesses need robust analytic tools to turn information into forward-thinking insight, such as the insight needed to change the direction of a negative trend or take advantage of a positive trend. 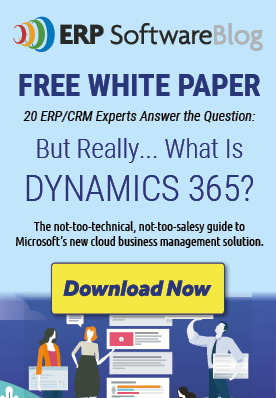 Microsoft Dynamics NAV provides simple but powerful analysis and report­ing tools that enable this kind of business intelligence. Understanding your business data is an important part of running a successful business. Microsoft Dynamics NAV helps enable better business insight for your entire company. With Microsoft Dynamics NAV, you and your employees can get the answers you need to your specific business questions – fast – through high-impact reports, charts and simple analysis.